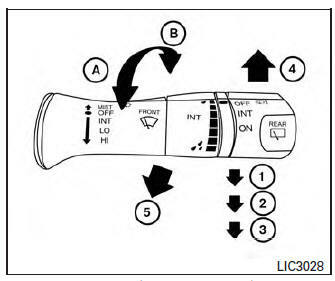 The windshield wiper and washer operates when the ignition switch is in the ON position. Push the lever up 4 to have one sweep operation (MIST) of the wiper. Pull the lever toward you 5 to operate the washer. The wiper will also operate several times. WARNING In freezing temperatures the washer solution may freeze on the windshield and obscure your vision which may lead to an accident. Warm the windshield with the defroster before you wash the windshield. Do not operate the washer continuously for more than 30 seconds. Do not operate the washer if the windshield-washer fluid reservoir is empty. Do not fill the windshield-washer fluid reservoir with windshield-washer fluid concentrates at full strength. Some methyl alcohol based windshieldwasher fluid concentrates may permanently stain the grille if spilled while filling the windshield-washer fluid reservoir. Pre-mix windshield-washer fluid concentrates with water to the manufacturer’s recommended levels before pouring the fluid into the windshield-washer fluid reservoir. Do not use the windshield-washer fluid reservoir to mix the windshield-washer fluid concentrate and water.